April 2, 2012 - Coast Guard Aviation Training Center Mobile played host to one of the last surviving Tuskegee airmen, Thursday, during a brief visit to the unit where he spoke to the crewmembers and trainees who are stationed there. Before his tour, Calvin Moret was treated to a tour of the facility that included in-depth descriptions of each of the different airframes that the training center utilizes. Moret was also allowed to pilot one of the high-tech flight simulators that are unique to ATC. After his address to the Coast Guardsmen of the training center, Moret was taken on an area flight in an HC-144 Ocean Sentry fixed-wing aircraft. The Coast Guard Aviation Training Center (ATC) in Mobile, Alabama is a multi-mission unit, acting as the Coast Guard's aviation and capabilities development center, as well as an operational air station. Training is conducted to qualify Coast Guard pilots in the HU-25 "Guardian", the HH-60 "Jayhawk", the HH-65 "Dolphin" , the HC-130 Hercules, the HC-130J Hercules, and the HC-144 "Ocean Sentry." All pilots initially trained at ATC return once a year for a one week proficiency course in their designated airframe. The ATC Mobile evaluation center is responsible for ensuring that Coast Guard aviation forces are using the best equipment and tactics to successfully complete all required missions. The Operations Division, flying the HC-144A Ocean Sentry, is a segment within the ATC command that conducts traditional Coast Guard air station missions including Search and Rescue, Homeland Security, and Environmental Protection. The Operation Division operates under the tactical control of the Eighth Coast Guard District and has area of responsibility that extends from the Louisiana/Texas border to the eastern edge of the Florida panhandle. Crewmembers from Coast Guard Aviation Training Center Mobile take Calvin Moret on a tour of their facility, March 29, 2012. Moret, a Tuskegee airmen, came to ATC to speak about his history with the historic fighter group and to share his personal experiences. 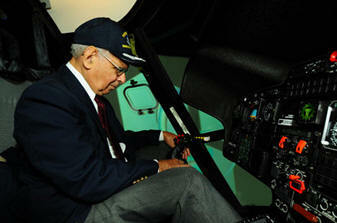 Calvin Moret figures out the controls to one of Coast Guard Aviation Training Center Mobile's high-tech flight simulators, March 29, 2012. Moret, a Tuskegee airmen, came to ATC to speak about his history with the historic fighter group and to share his personal experiences. The mission of the Aviation Training Center (ATC) is to produce mission ready aircrews and develop aviation capabilities. ATC provides core training for rotary wing and fixed wing pilots, rescue swimmers and aircrews for air stations Coast Guard wide. 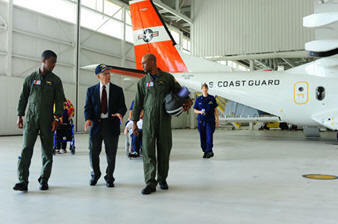 ATC also serves as the Coast Guard's aviation capabilities development center. ATC provides direct aviation support to Coast Guard Atlantic Area and the Eighth Coast Guard District.